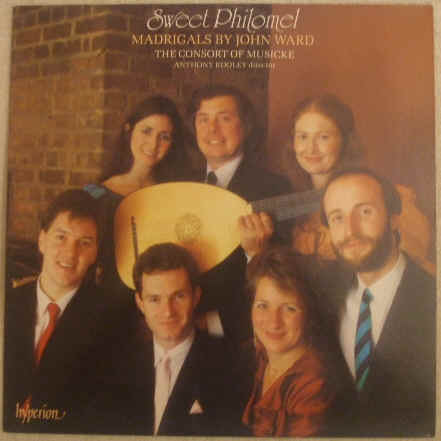 33rpm 12-track LP Record of SWEET PHILOMEL MADRIGALS BY JOHN WARD, featuring the Consort of Musicke (Emma Kirkby, Evelyn Tubb, Mary Nichols, Andrew King, Rufus Muller, Alan Ewing), director Anthony Rooley. It was issued on the Hyperion Records label in 1987. Catalogue number: A66256. UK pressing. Signed by Anthony Rooley and Emma Kirkby on the back cover (see picture below). The record itself is graded excellent, with no visible surface marks when viewed under normal house lighting. Play-tested on an AIWA turntable. Superb sound quality, with NO jumps, ticks, pops or crackle. Just about faultless playback. The outer sleeve is also graded excellent with no more than very light wear. The inner sleeve has no wear to speak of.